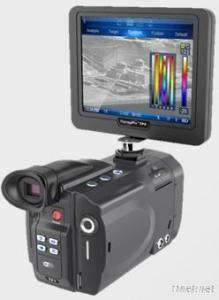 TP9 is a creationary, advanced and intellective infrared camera provided by GUIDE. Utilizing the latest generation high-performance IR detector with 640× 480, the camera not only offers extraordinary high resolution, high sensitivity and high accuracy presented by the real-time thermal images, but also offers the formidable temperature analyzed function, with the ergonomical design, TP9 can make you exclaim. Utilizing the latest generation high-performance IR detector with 640× 480, 25μm, the camera offers extraordinary high resolution, high sensitivity and high accuracy presented by the real- ime thermal images and the wider filed of view. The 5.7 inch, semipermeable and half-reflection touch screen dilivers convenient operation and observation. With the 5 million pels high-definition visual camera and the brightness adjustable lamp, we can capture the clean ahd sharp visual images.